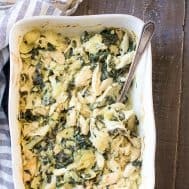 This creamy hot spinach artichoke dip has shredded chicken for extra protein, so you can easily make it part of a healthy paleo or Whole30 meal! Perfect with veggies, over a baked potato or with sweet potato toast. 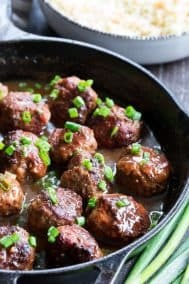 Dairy free, paleo, Whole30 compliant, low carb and keto friendly. I hope I’m not the only spinach-artichoke obsessed gal in the room right now. Figuratively speaking, of course, since as I’m typing this the only other person in the room with me is my son, who’s neither a gal nor obsessed with spinach-anything by any means. 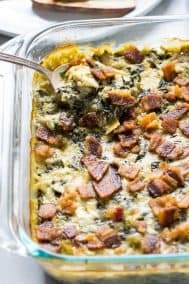 But if you’ve stumbled upon this post, I have to think you’re into the savory, creamy deliciousness of spinach artichoke dip. And just you wait – it gets so much better than that! Way back in the day, I used to make a super cheesy (like with 4 types of cheese!) baked spinach artichoke dip. Then, last year, I decided it was finally time to test out a paleo and Whole30 version, since the old 4-cheese one probably wouldn’t ever be made again. 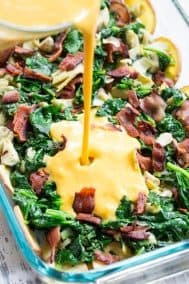 So, I came up with this version (it involves bacon) and was pleasantly surprised at how “cheesy” it tasted without any dairy at all! Pretty amazing, I will say. 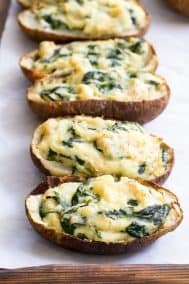 In fact, I loved it so much that I decided create a vegan AND Whole30 spinach artichoke twice baked potato. 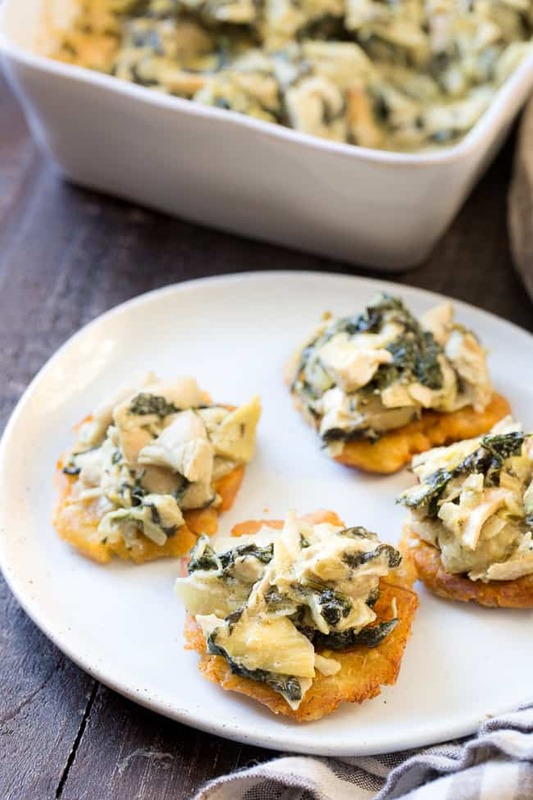 I’m fully devoted to dairy-free spinach artichoke creations now and there’s no need to turn back! 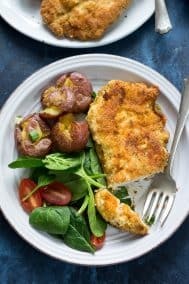 This time around I was craving something with a bit more protein, something that could really be almost a meal along with some extra veggies, a potato or sweet potato – you get the picture! 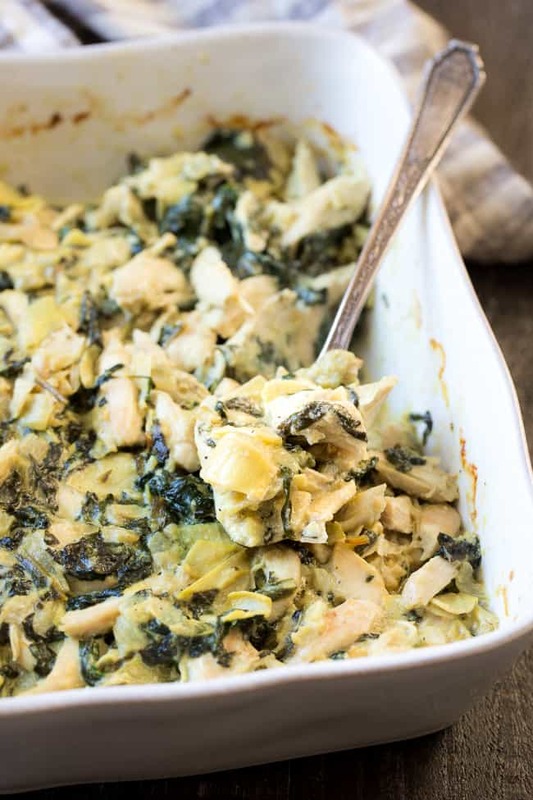 I considered making spinach artichoke chicken thighs (and still may do that!) but decided on something with just as much protein but more versatile – a dip. Or topping, or whatever you want it to be, really. 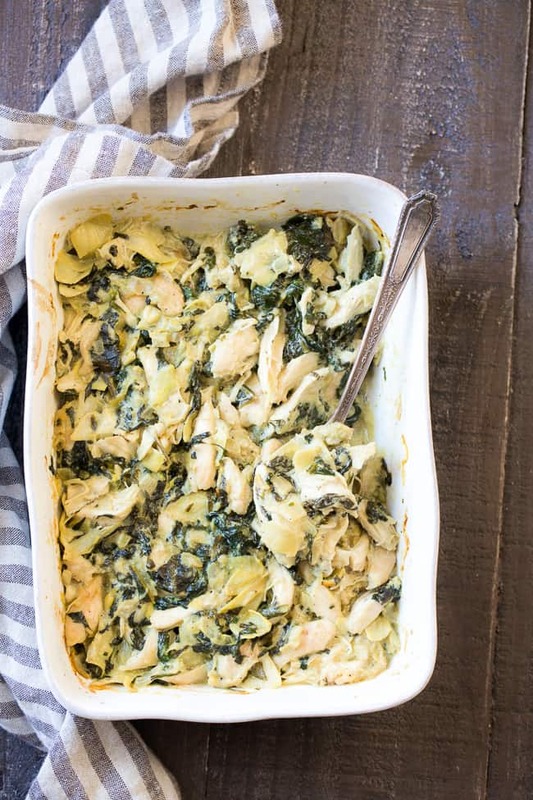 This creamy chicken spinach artichoke dip is pretty perfect however you decide to serve it. 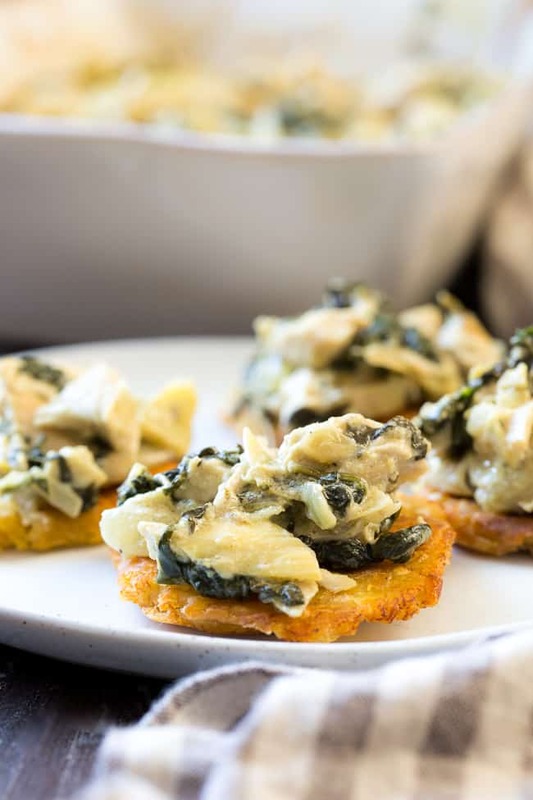 When I made it for the first time, I had a bunch of green plantains and decided that my Whole30 tostones would make the perfect “vehicle” for the dip. Holy cow – so delicious! Since I had plenty of leftovers after shooting the photos, I tried it over a baked potato, sweet potato toast, and even just by itself over the next couple of days. No complaints here! Even Adam (husband) who claims not to actually like spinach or artichokes, really enjoyed this dip. 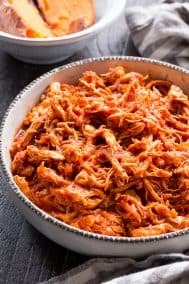 And seriously – with the seasoned cooked chicken, onions and garlic, creaminess from the coconut cream and homemade mayo, PLUS an extra cheesy kick from nutritional yeast? Let’s just say it all comes together as deliciously as possible. As a side note – I highly recommend using homemade mayo for this one (rather than store bought paleo mayo) since the flavor is so much better this way. And, another side note – even if you’re a coconut hater, you really don’t taste the coconut cream here, since the other flavors overpower any hints of coconut. I hope you’re ready to make this – it’s easier and quicker than you might think! And, the rewards will speak for themselves after the first bite. Let’s go! Place chicken on the sheet, drizzle with olive or avocado oil and sprinkle with sea salt and pepper. Place in the oven and bake about 20-25 minutes until cooked through. Remove from oven and set aside. While the chicken bakes, heat a large skillet over medium heat and add the ghee or coconut oil. Add the onions and cook until soft, then add garlic, sprinkle with sea salt and continue cooking another minute, adjusting heat if necessary, until soft. Once garlic is soft, add spinach and allow it to wilt a bit, then mix in to garlic/onions and cook until all is wilted. Add artichokes and cook one more minute until heated through, sprinkle with a bit of sea salt, then remove from heat set aside. 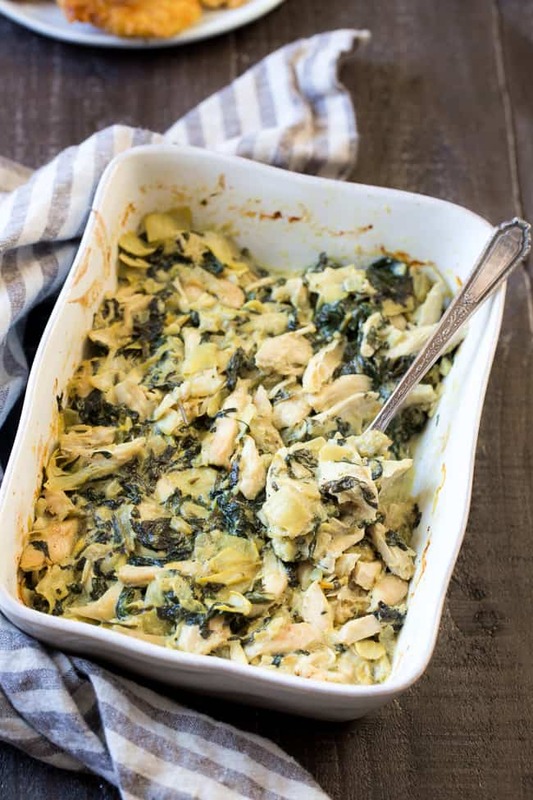 Chop or shred the cooked chicken into bite size pieces, then add to the mixing bowl along with all the spinach artichoke mixture. Stir to combine everything, then transfer to a small casserole dish. Bake in the preheated oven for 10-15 minutes or until heated through, then remove from oven and serve warm. Goes well with potatoes or sweet potatoes, plantains, your favorite veggies or anything! Enjoy! *You can purchase Whole30 compliant avocado oil mayo here. 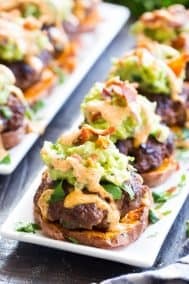 Want More Whole30 Appetizers and Dips? Try One of These! Love this idea! I actually used your spinach artichoke dip as a dairy free ‘alfredo’ sauce just last night. I added sun dried tomatoes, grilled chicken and brown rice/quinoa pasta. Oh yes and of course turkey bacon cooked up nice and crispy. Love your dip recipe!! Make it quite frequently. Sometimes I make it and just serve it as a side dish. Keep the delicious recipes coming. Love you take one recipe and add different twists to them. Oh wow that sounds delicious! Happy New Year to you! What are those round crackery things in the photo that the dip is served on? Inquiring minds, right???? Enjoying this right now with a simple salad. Thanks for making my Day 1 a lot easier! So thrilled you’re enjoying it! I just made this with leftover turkey. Awesomely delicious! Thank you for sharing your culinary expertise. I’m so thrilled you liked it!! I can’t wait to try this with all l.o. chicken in my freezer. 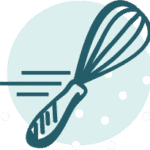 Ever consider writing a cookbook? I would totally buy it. I love your work! I wish you peace in this new year. I do hope to write a cookbook at some point, happy you’re enjoying the recipes! Happy New year! 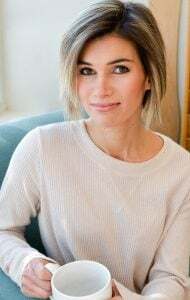 I hope you write a whole 30 cookbook soon. That would be awesome! This was DELICIOUS!! I did everything exact except I used shredded manchego cheese in place of Nutritional yeast. I think next time, I may just omit the cheese altogether. Great, filling meal! 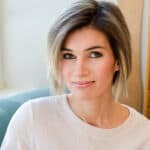 I have been a primal/paleo advocate for years and stumbled upon you through instagram…so glad I did! I will definitely be making more of your recipes! Hi Michele, I too made this recipe and it was AWESOME! I definitely will be making it over and over again. What is considered a serving size? I have down about 1/2 cup, but I wanted to make sure that was a correct serving for the nutrition facts provided. Thank you for sharing! Help! I couldn’t find Nutritional Yeast. Will instant yeast work in its place? They sell it at Trader Joe’s and I’ve seen it at Whole Foods and wegmans ? I too would like to know a substitute for Nutritional Yeast! Unfortunately there is no substitute, but you can omit it and it won’t terribly alter the result. This recipe is delicious! I’ve made it multiple times now, with and without the chicken. It’s creamy and full of flavor! Most of my family doesn’t even realize there’s no cheese in it. It’s my go to party dip now! Thank you! Hi! Excited to make this! What is the serving size for the nutritional facts you provided? 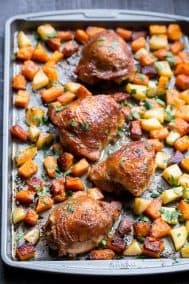 We just made this for dinner tonight and I am OBSESSED! I did use store bought paleo mayo and it was still delicious!! Thank you for creating this re pie! My husband and I went on and on about we couldn’t believe this was a healthy dish! Never would I ever go back to my unhealthy version of this dish again! Wow! I never thought it would be possible to have a dairy free artichoke dip. That is so cool! I can’t wait to try this at home. I definitely miss these types of delicious dips when on Keto diets. Thank you so much for sharing! Looks so yummy! What is the serving size for the nutritional facts you provided? This sounds so good! But I don’t do well with Mayo. What can I substitute? Thx! This looks amazing! Do you think i could make it in the slow cooker? I made this today for our after school snack. It was so good. A hit with the kids, the husband, and myself! We will make it again for sure!